Last week I made my first stab at designing a retirement income strategy that adapts to portfolio performance. By allowing monthly income to vary we can overcome serious problems with the “4% rule” and rules of thumb about the percentage of bonds in your portfolio. Unfortunately, the monthly changes in income were too erratic. I now have a fix for this problem. Stocks were extremely volatile from 2000 to 2013 and the goal of this experiment was to design a retirement spending plan that doesn’t have the monthly spending amount vary too much while controlling the risk of overspending and draining savings too early. The latest feature I’ve added is some filtering on the changes in spending. When the strategy calls for spending to increase from one month to the next, I actually only increase it by 1/40 of the called-for amount. One way to think of this is that it takes roughly 40 months for spending to rise to meet an outperforming portfolio. When the strategy calls for spending to decrease, I only apply 1/20 of the decrease. So, it takes roughly 20 months for spending to drop to reflect an underperforming portfolio. This adds some risk of spending too much while stocks drop sharply, but 20 months’ worth of spending is only one-third of the 5 years’ worth of HISA savings. So how well does this new filtering smooth out monthly spending? 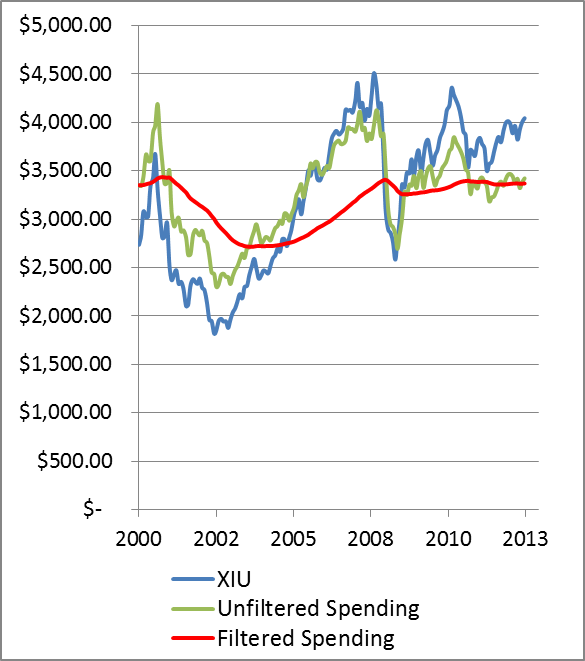 The following chart shows the performance of XIU with reinvested dividends, the unfiltered spending from the previous experiment, and the new filtered spending. All are inflation-adjusted. 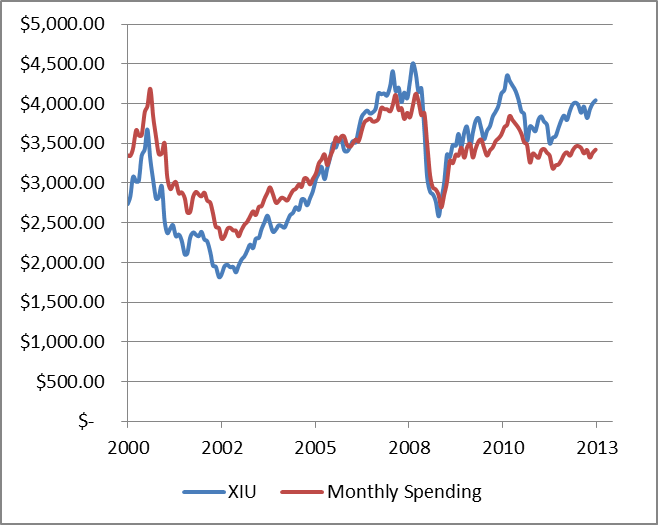 Without any filtering, monthly spending reacted immediately to changes in XIU leading to a very bumpy ride. With the filtering, changes are much more gradual but still show good reaction to XIU returns. For example, if XIU had stayed down from 2002 onward instead of roaring up, the filtered spending would have reacted to the new reality in a couple of years. Overall the addition of the filtering seems to have given us a good compromise between reacting to permanent changes in a portfolio without causing monthly spending to jump around wildly. I’m definitely interested in feedback on this retirement spending strategy. Are there flaws? Are there market events that it would react to badly? Disclaimer: It would be crazy for anyone to blindly follow my recipe for retirement spending at this point. It needs much more analysis. Hmm. That strange line appeared in my InvestorLine RRSP statement. It seemed to be related to my latest Norbert Gambit, which is a way to save money with currency exchanges. All have gone reasonably smoothly until recently when I was hit with a mystery interest charge. To exchange Canadian dollars for U.S. dollars, I have bought the exchange-traded fund DLR that trades in Canadian dollars and then sold the equivalent ETF DLR.U that trades in U.S. dollars. The idea is simple enough, but a mistake with some accounting generated an interest charge that shouldn’t be there. To make everything balance out, InvestorLine adds some extra transactions to the Norbert Gambit trades. I did the trades on a Monday. This means that the trades settled three days later on Thursday. So my account statement showed a buy of DLR units and a sell of DLR.U units. To balance things out, InvestorLine added a transfer out of DLR units and a transfer in of DLR.U units. Unfortunately, they accidentally showed these extra transfers as taking place on Wednesday instead of Thursday. Oops. So, this means InvestorLine computers thought my account was short units of DLR on Wednesday (“short” means I held a negative number of shares). I was charged 21% interest for one day which amounted to over $40. Maybe the rate was so high because I was using an RRSP account where margin isn’t permitted. InvestorLine quickly agreed to reverse the charge, but if I hadn’t noticed it and called them, I don’t think this would have been fixed. The moral of the story is to check your account statements for unusual activity. This is easy to overlook when you have online account statements. Freakonomics reports on research into why women earn less than men. The finding that women seem less willing to compete for higher pay is consistent with my experience. Among the most competitive business people I know who have questionable morals and are willing to devote far more than 40 hours per week to their careers, the vast majority are men. The Blunt Bean Counter looks into investing in NFL football player Arian Foster. I suspect that fans will consistently overpay for shares of professional athletes. Owning a slice of a player might feel good but I doubt that it is likely to be a good investment. Canadian Capitalist answers a reader question about whether it makes sense to maintain an allocation to bonds. Canadian Couch Potato has some concrete advice for ETF investors who are looking to do some tax-loss selling. Larry Swedroe explains how bond dealers hide their cut in the yields they offer. Big Cajun Man asks when you got your first credit card and discusses how attitudes toward credit cards have changed over generations. Where Does All My Money Go? interviews a legal expert about what happens to digital assets when you die. Million Dollar Journey gives an answer to the question of how much money you have to save for early retirement. I think the assumptions used are a little optimistic, but I’m still mulling over what I think is the best answer. Sandi Martin writes an open letter to the big banks inviting them to blow her mind. I wouldn’t count on banks making any of the suggested changes. To predict business behaviour, it’s better to think of businesses as profit-seeking machines capable of little else instead of thinking of them as collections of people with feelings. However, just reading her letter was cathartic for me. My Own Advisor bemoans the constant barrage of financial product promotions. It’s easier to make a living convincing people to give you their money than it is to build a better mousetrap. I find most rule-of-thumb strategies for drawing retirement income from savings very unsatisfying. We have things like the “4% rule” and using your age as a percentage for your bond allocation, but such one-size-fits-all rules can’t possibly fit everyone. Here I introduce my own candidate strategy for generating retirement income. The 4% rule says that when you start retirement you can calculate 4% of your initial savings and spend this much each year rising with inflation. So, if you have $1 million saved, you spend $40,000 in the first year and increase this amount by inflation every year. Of course, the main problem with this rule is the possibility of running out of money. If your investments perform poorly in the first few years, you just keep spending based on your initial savings even though your savings will start to dwindle quickly. A second problem is that everyone uses the same percentage regardless of how they invest their money. Suppose two investors, April and Ben, have exactly the same asset allocation. But April is a do-it-yourself investor who pays 0.2% in ETF fees each year, and Ben pay 3% fees each year on his mutual funds. Obviously, Ben’s spending has to be 2.8% lower than April’s. If April can only spend 4%, then Ben can only spend 1.2%. Yet another problem is the inconsistency of treating two investors differently when they have exactly the same portfolio size. Suppose that Cheryl and Dan are both 70 years old, have been retired for 5 years, and both have $1 million in savings. However, Cheryl’s portfolio began 5 years ago with $1.1 million and Dan’s has stayed steady at $1 million. The 4% rule will have Cheryl spending 10% more than Dan because she started with the larger portfolio. But this makes no sense given that they are in the same position now. You could even argue that Cheryl should spend less than Dan because her portfolio returns are weaker than Dan’s and, being a woman, she is likely to live longer. People have different risk tolerances. Some of these differences are rational and some irrational. A tenured professor might reasonably have more appetite for stock risk than a middle manager in a high-tech company. A retired 55-year old might reasonably have less appetite for risk than a 55-year old who plans to work for another 10 years. On the irrational side, some people simply can’t sleep at night with any of their money in risky investments no matter what a rational analysis might conclude. Given these differences, how can we have a one-size-fits-all bond allocation rule make sense? Any strategy that keeps income completely stable (like the 4% rule) is going to either have a risk of running out of money or have such a big margin of safety that income will be very low. So, we need a strategy that adapts monthly spending based on portfolio performance. The goal is to find a way to keep spending as steady as possible without undue risk of running out of money. I’m sure that financial advisors will tell me that many of their clients simply could not tolerate a reduction in their monthly spending. While this may be true, I would rather slowly reduce my spending than just run off the edge of a cliff when the money runs out. So, even if many people can’t adjust their lifestyles until all the money is gone, I’m more interested in a strategy that makes sense. That said, I still think controlling the volatility of cash flow is an important goal. So here’s the idea. After retirement, we maintain 5 years of spending in a high-interest savings account (HISA). The rest gets invested the same way it was before retiring. In my case, that’s 100% low-cost stock index ETFs. The tricky bit is calculating the appropriate monthly spending amount. And because this amount will vary somewhat, the 5 years’ worth of savings in the HISA will vary somewhat. This means that there will be rebalancing between the HISA and the investment portfolio. To calculate monthly spending, we need to make a series of assumptions. We choose a spending level so that if our return assumptions are exactly correct, we will run out of money at a chosen life expectancy. If returns are higher than expected then spending will go up the next month, and if returns are lower than expected then spending drops. As we will see in an experiment, monthly spending based on this rule turns out to be more stable than portfolio returns. This may seem conservative for an all-stock portfolio, but if we choose this to be too high then retirement spending will drop over time. I think it makes sense to choose this percentage to be lower than historical returns, but how much lower depends on how accepting you would be of reduced monthly income. Another thing to consider is that this percentage should be lower for investors who choose to include investments in bonds, real estate, or any other asset classes that historically have had lower returns than stocks. I’m assuming here that the high-interest savings account interest will just match inflation. I don’t have any particular justification for using 5 years other than it seems like long enough to stay sheltered from some wild swings in the stock market. This is conservative, but hey, who wants to run out of money early. It probably would make sense to increase this life expectancy age is we get closer to it. Perhaps the remaining life expectancy should never go below 15 years. Using these assumptions, I did an experiment based on a 60-year old retiring at the start of the year 2000 with $1 million in today’s dollars. (All of the dollar amounts in the experiment are adjusted for inflation.) The portfolio holdings other than the money in the HISA are invested 100% in the Canadian stock ETF XIU. I don’t recommend such a high concentration in Canadian stocks, but the goal here is to see how portfolio volatility affects monthly retirement income. A few other details were that I assumed stock trades cost a $10 commission, a one-cent per share loss due to spreads on each XIU trade, and we only make stock trades when the amount of cash in the HISA is more than 5% from its target value. Here are the steps that get performed at the start of each month. 2. Calculate the amount that needs to be in the HISA to support 5 years of this monthly spending. 3. If the actual HISA balance is low by more than 5% of its target value then sell enough stock (or other investments) to bring the HISA up to target. Selling stock periodically is inevitable as we spend down our savings. 4. If the actual HISA balance is high by more than 5% of its target value then transfer the excess from the HISA and buy stock (or other investments). This can happen when stocks drop sharply. The following chart shows how monthly spending, adjusted for inflation, varied from the year 2000 to the present. 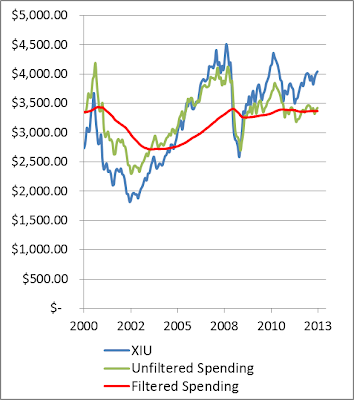 Also shown on the chart is the value of XIU with reinvested dividends adjusted for inflation. The starting dollar amount of XIU was chosen to best contrast XIU price with monthly retirement spending in the chart. While the XIU investment value varied over a range of 98% of its starting level, monthly spending varied over a range of 56% of its starting level. So, monthly retirement spending is less volatile than stock prices, but perhaps still too volatile. At this point you may ask why monthly spending has to be so volatile. After all, if the stock market drops, it will probably come back eventually. This may or may not be true, but the model I used always assumes that whatever the current stock market level, this is the base from which steady 3% above inflation gains will be made. So, in this sense, we assume any big drop in stock prices is permanent and spending must go down. Factoring in some amount of stock price reversion of the mean in the model may be a path to improving my strategy, or it may just increase the risk of running out of money. This time the monthly spending is steadier; it varies over a range of only 45% of its starting value. The trade-off is that monthly spending is generally about 10% lower in this case because more of the retiree’s portfolio is locked up in the low-return HISA instead of in XIU. 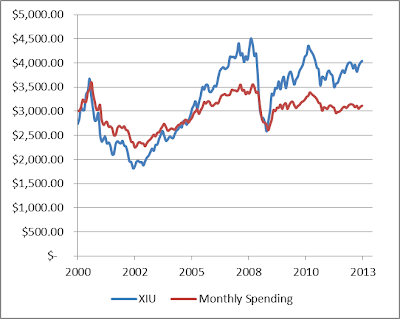 Despite XIU’s volatility, it did give a positive return above inflation from the year 2000 to the present. I haven’t dealt with taxes or the complication of a portfolio split across a number of different types of accounts, like RRSPs, RRIFs, TFSAs, and taxable accounts. I haven’t factored in CPP benefits or old age security. As well, I’ve only experimented with one time period for stocks. However, I did choose a very volatile period that included two significant bear markets for stocks, so at last we have a test of severe conditions. Overall I consider this to be just a starting point for my thinking on how I’ll handle my own portfolio when I choose to retire. To be clear, I think it would be crazy for anyone to blindly follow my recipe for retirement spending. I’m very interested in ideas for improving it. Scott Adams (the Dilbert comic guy) described a very interesting idea for creating a type of marketplace for online teaching tools that would allow people to find the best materials for learning each individual subject. It would also allow highly-skilled developers of online courses to make money. I think some variant of this is likely to replace our current bricks and mortar method of teaching. But the transition won’t be easy. A critical component of online teaching tools that Adams didn’t mention is collecting student feedback in real time. Imagine if software could detect when a student looks tired or frustrated and could adapt the teaching style accordingly. This is what good tutors do and there is every reason to believe that a combination of a computer camera, microphone, and some great software could replicate some of this benefit. A problem that online teaching tools are certain to encounter once they become a bigger threat to the enormous business of bricks and mortar teaching is changing terminology and notation. It’s common for professionals to use jargon to protect their incomes from outsiders. Teachers can easily do the same thing. Over the years that I tutored math, my biggest challenge was to determine what terminology my tutee’s teacher used so that I could match it. A teacher threatened by a particular set of online teaching tools can easily adjust some jargon and notation to make it more difficult for students to learn from the online materials. Standardized tests could easily be created with a strong bias toward jargon used in class rather than that used by the top online materials. I don’t think this problem of jargon and notation is insurmountable, but I predict that it is one of the ways that bricks and mortar teachers will fight back in a long, drawn out, and ultimately losing battle against online teaching materials. Tom Bradley at Steadyhand gives us a sample of their improvements to disclosing mutual fund fees on client statements. One of the most financially enlightening things I do for friends and family is tell them how much they pay per month in investment fees (in dollars rather than percentages). For investors who get good advice for their money, this is just some interesting information. For other investors who get little for their money, the monthly cost is surprising and frustrating. Freakonomics performs a gruesome experiment sending fake pet remains to pet crematories to see what would come back. The crematories promise to send back just your pet’s remains, but in each case they sent back bone ash (even though the fake pets were just fur and hamburger). This should make you wonder if the remains on your mantel really belong to your beloved Fluffy. Canadian Couch Potato reports that more swap-based ETFs like Horizons HXT are poised to hit the market. If all goes smoothly with the counterparty swaps, these ETFs have better tracking error than their competitors which leaves more money in investors’ pockets. The difficult thing is to estimate the odds of a counterparty default. For example, if such a default were to cost investors 10% of their assets and defaults are expected to happen once per century, the expected cost is about 0.1% per year. I don’t know whether these estimates are optimistic or pessimistic, so I haven’t bought any swap-based ETFs yet. Canadian Capitalist draws some investing wisdom from the Canada Pension Plan. My Own Advisor says unbundled cable packages can’t come soon enough. My initial reaction was to look forward to unbundling. However, cable companies aren’t just going to sit around and accept lower revenues. I expect that they will find a way to extract as much or more money from us after the law changes. Big Cajun Man seems very Scrooge-like with his tips for a frugal Halloween. Where Does All My Money Go? interviews David A. Whitten to discuss job security after maternity leave. The Blunt Bean Counter brings us a guest post explaining qualifying spousal trusts. I suppose it’s not good enough for me to plan to live long enough to spend all my money. Million Dollar Journey brings us a 34-year old millionaire’s five financial principles. He beat me by a year. You’ve looked at your Canada Pension Plan statement of contributions and it says you could receive a certain monthly pension amount when you turn 65. What does this mean? What about inflation? Is this the amount I get if I never work again? The truth is that it is hard to understand future CPP payments in terms of dollar amounts. It’s much easier to understand it all when you think in percentages. Doug Runchey, who worked as a specialist in CPP for many years, definitely understands CPP better than I do. The challenge is to explain it clearly to others. Doug’s most recent post on understanding CPP statements of contributions and a much more detailed post on the math of calculating your CPP benefits have certainly helped me. After wading through the details, I find it easiest to think in terms of what percentage of the maximum CPP benefits I will get. Because CPP benefits are indexed (they rise with inflation), talking about dollar amounts gets confusing because the number of dollars you get is a moving target. The “maximum payment amount” is $1012.50 per month in 2013, but it will be higher in future years. What stays constant (absent any rule changes or extraordinary events) is your percentage of this maximum amount. Adding to the confusion is that it is possible to get more than this so-called maximum amount. What your CPP statement of contributions tells you is what percentage of the maximum pension amount you will receive if you continue the same pattern of work that you’ve shown in the past. Suppose that your statement says you could get $800 per month. This is 79% of the maximum payment of $1012.50 per month. If your work pattern continues to stay about the same until you get to age 65, you can expect to receive 79% of whatever the maximum payment happens to be when you start to collect. We should even think of the dollar amounts shown on CPP statements in terms of percentages. In each year your CPP deductions added up to some percentage of the maximum contribution. If you pay 100% every year, you can reasonably expect to receive a 100% CPP pension. If your CPP deductions are less than 100% of the maximum each year, you can likely expect a pension of less than 100% of the maximum. There are a number of factors that can increase your pension percentage. You’re allowed to drop out a certain number of lower-percentage years before averaging the remaining years’ percentages. Allowances are also made for years spent caring for young children. Another important factor is your age when you start collecting CPP. Under rules that will be fully in effect in 2016, the maximum CPP pension amount actually scales with your age when you start collecting. The $1012.50 figure for 2013 is based on collecting starting at age 65. If you wait until age 70, your maximum amount is 42% higher, and if you start at age 60, it is 36% lower. In the example of a 79% CPP pension that we had earlier, the 79% gets applied to the maximum pension payment amount after it is adjusted for your age when you start collecting. Got it? Should be clear as mud now. BlackRock Canada has launched seven new mutual funds that are built with the iShares ETFs. The main difference between these funds and the typical mutual funds that Canadians own is that BlackRock’s funds are based on passive index investing instead of active stock-picking and the new funds have somewhat lower fees. However, the new funds are still much more costly than building a do-it-yourself portfolio directly using low-cost index ETFs. The new funds consist of six funds covering a range of risk levels along with a seventh fund focused on monthly income. The following table shows the target allocation and costs of the various new funds (management fees plus administration fees for the Series A funds). I compiled this information from the simplified prospectus. The fees for Canadian actively-managed mutual funds are usually in the 2-3% range. The BlackRock mutual funds look good in this comparison. The new funds’ fees are high enough to cover trailer fees paid to financial advisors, so these funds are likely to become popular with advisors. I’d like to think that any investor who sees the make-up of these funds could easily buy the underlying ETFs directly and avoid paying the extra 1%+ every year. However, for various reasons this is difficult for many investors. These people are doomed to pay the extra 1% that builds up year after year to about 22% after 25 years. Overall, these new funds are pushing fees down which is good for investors, even if these fees could be much lower still. Disclaimer: BlackRock did not pay me (directly or indirectly) for this review, and I do not own any of these funds. A recent Family Finance column in the Financial Post showed something strange about the way that financial planners calculate a person’s net worth. Apparently, having a defined-benefit pension plan does not add anything to your net worth. The article profiled Doris, a grandmother with a simple balance sheet. She has a car worth $3000, owes $10,000 on her line of credit, and can begin drawing a $1400 per month pension in two years. For some reason, her pension just doesn’t count and her net worth is listed as -$7000. This isn’t an isolated case; I’ve seen this in many other net worth statements as well. With a negative net worth at age 63, Doris appears to be in dire circumstances. However, a pension of $1400 per month plus CPP and old age security are more than enough to give her a modest but comfortable life. Without the pension, Doris would be far worse off, so why doesn’t the pension count as part of her net worth? To value her pension we would need more details about the pension than the article gives. Let’s approximate its present value at about 15 years’ worth of payments, or about $252,000. This would make her net worth $245,000, which better reflects her true financial condition. We could add in the present value of CPP and old age security as well, but since most people get these payments, this doesn’t add much to our ability to compare Doris’s financial condition to other people’s financial conditions. 1. Pensions are hard to value accurately, so we don’t try. The present value of a pension is somewhat tricky to value. You have to take into account indexing, current interest rates, mortality rates, and other factors. However, just about any kind of guess is better than guessing zero. 2. Doris’s pension payments are not guaranteed because she might die before receiving the first monthly cheque. This is true, but Doris is seeking financial planning out of concern for her future. If she knew she was going to die soon, she wouldn’t be too worried about her monthly cash flow. In fact, if Doris wants to be sure that she will be okay financially until age 95, she should value her pension at even more than just 15 years’ worth of payments because she is presuming that she will collect for 30 years. 3. The value of Doris’s pension is not available to a financial advisor to increase his or her assets under management. This is a pretty cynical possible reason, but it gets to the heart of the potential conflict here. From Doris’s point of view, her pension is very valuable, but to others such as financial advisors and heirs, the pension has little value. What do you think is the real reason why pensions are not valued in some net worth statements? Dividend Investing: A Good Idea or a Huge Mistake? Canadian Couch Potato discusses what he sees as the biggest challenges for DIY investors. Million Dollar Journey explains how bankruptcy affects your life. The Blunt Bean Counter has another cheery topic where he explains what happens when spouses don’t leave all their assets to each other in their wills. Big Cajun Man isn’t a big fan of a heavy allocation to stocks after retirement. My Own Advisor goes against the advice of many bloggers and explains why he intends to keep his traditional cable television. Where Does All My Money Go? will be turning into a personal finance video blog, and Preet is looking for feedback on content and a new blog name. One of the questions the Big Cajun Man asked me and the other panelists in a session at the 2013 Canadian Personal Finance Conference was whether dividend investing is a good idea. My answer was that while it is possible to do dividend investing well, few dividend investors invest well. A common portfolio for Canadian dividend investors is one consisting primarily of Canadian big bank stocks. This is a very concentrated risk. To be invested entirely in Canada is bad enough, but to be invested in a single industry is worse. Who is to say that all the big banks will still be operating in 20 years? The downfall of Nortel was inconceivable 20 years before they declared bankruptcy. The average investor should have stock investments spread across industries and countries. To be invested in Canada and the U.S. isn’t too bad, but it’s better to own some foreign stocks as well. One solution is to own some low-cost index ETFs of foreign stocks along with individual dividend stocks in Canada and the U.S. Some analysts fear that the popularity of dividend investing has driven up prices making dividend stocks expensive right now. My crystal ball is permanently cloudy, but even if this is true, it is only a short-term concern. For investors planning to hold on for the long-term, short-term results are not the focus. Many dividend investors try to beat the market by choosing superior dividend-paying stocks. Unfortunately, some blogs devoted to dividend investing offer hopelessly superficial dividend stock analyses to “help” this type of investor. The thundering herd of dividend investors can expect their stock-picking to be essentially random. When the stock picks are random, you need to own enough stocks to reduce volatility-induced losses. One bright area for dividend investors is that by focusing on their fairly steady dividends and not the volatile stock prices, they tend to stick with their plans rather than selling out when stock prices drop. Investors who jump around from one hot stock fad to another repeatedly selling low and buying high can easily trail stock index returns by 5% per year or more. So, if a dividend investor is fairly well diversified and can expect to earn say 1% per year less than the stock indexes due to higher volatility, at least he or she isn’t losing 5% per year to manic strategy changes. Overall, I still prefer to own low-cost stock index ETFs whose long-term performance will only trail the market return by less than 0.25% per year, but well-diversified buy-and-hold dividend investing isn’t too far behind. Tom Bradley at Steadyhand makes a great observation that too few new stocks listed on the TSX are for companies that actually create products as opposed to financial listings that just slice and dice other equities. Big Cajun Man gives an overview of the panel discussion held at the 2013 Canadian Personal Financial Conference. I was pleased to serve on the panel and I plan to write a few posts that expand on my answers to the panel questions. My Own Advisor calls out some financial prophets for their bad predictions. Where Does All My Money Go? interviews Alyssa Richard, founder and CEO of RateHub.ca. Canadian Capitalist updates his sleepy portfolio and explains the details of his rebalancing. The Blunt Bean Counter explains 5 ways to make charitable donations and the tax implications of each. Potato found a funny creative outlet for his frustration over sitting on hold waiting for the start of a teleconference. This resonated with me because I frequently wait for teleconferences that never begin. Financial Advisor or Do It Yourself? The debate about whether you are better off to seek financial advice from paid advisors or to do it yourself (DIY) rages on. Both sides make good points, but they don’t exactly address the same issues. Advocates of financial advice point out that most people just don’t have the knowledge to properly invest their own money. Even those with the right knowledge tend to make emotional mistakes that lead to portfolio destroying buy-high and sell-low behaviour. This is all true. However, the majority of investors who seek out a financial advisor will not get the good advice they need. There are great financial advisors out there, but there are more mutual fund salespeople who have little investing knowledge beyond understanding that they need more assets under management to earn enough income to pay their bills. DIY advocates say that a basic indexing approach is simple and easy to implement and will outperform the majority of investors. This is true. I do this myself and find it quite simple. The most challenging part is to avoid making emotional decisions in volatile markets. However, discussions with many investors have persuaded me that most people will never handle their own portfolios successfully. Many won’t try out of fear. Others will chase performance in mutual funds. Some will take wild chances on a small number of individual stocks as I did earlier in my investing career. This all leads to a somewhat depressing conclusion. Despite the fact that investing successfully can be simple, the majority of people need help, and the odds are that they won’t get good help even if they seek it. In the end, I think asking “financial advisor or DIY” is the wrong question. A better question is how do we fix the current investing landscape? I see two possible routes. One is to take the choice out of people’s hands to some degree by expanding the government’s role, perhaps by increasing CPP deductions and benefits. Another possibility is to drastically change the rules under which financial advisors operate. Making them meet a fiduciary standard would be a great change. Many investors would be shocked to learn that their advisor is not required to act in their best interests.